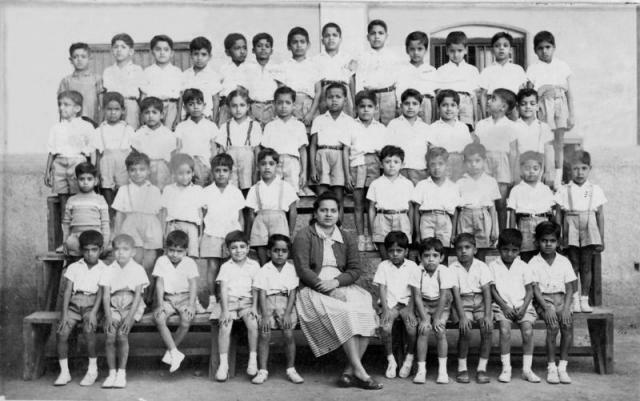 My Ist Std class photo ... somewhere in the year 1963-64 or 1964-65... I am standing in the 2nd row, second from left..... some of the friends names I still remember are : 3rd Row (Top Row) : From Left 1. Bharat Shah, 2. Haider, 3. Carl. ...... 8 & 9. the two Borders. 2nd Row Standing : From Left : 1. Tommy, ..... 5.Jasbir Singh ( who I met somewhere in the year 1996 ) 1st Row : Me 2nd from left, ... 6. Chetan. Sitting : 1. Glen....3.Allen 4.Jamshed......... and sorry I forgot my class teacher's name......... can anybody help me with the other names.